I first saw Goldfrapp live before this album came out. They were supporting Moby in his Play tour at the Manchester Apollo. Next week the album came out and a friend of mine immediately got it, we spent that night partaking in illegal drugs and listening to this. Suffice it to say that we weren't listening to Moby's Play. This album was something totally new and that you only had to hear once to know there was something unique here. A few weeks later I saw Goldfrapp again in a tiny room at the Manchester University students union, front row in a room that fit some 50 people. The time I saw them after that it was already in the Black Cherry phase, a great but vastly inferior album... also in the front row for that one, where Alison Goldfrapp made a very interesting dance with a portable theramin on her crotch in front of my face while covering "Yes Sir, I Can Boogie". It was special. From then on I lost interest in them, this was their great album. Cinematic, weird, beautiful and deranged, a work of art which is hard not to love. "Lovely Head", Felt Mountain's opening track, features high lonesome whistling and heavily processed vocals. The song was described as influenced by Shirley Bassey and released as the album's lead single. The second track, "Paper Bag", is about being obsessed with someone and not being able to have them. It is followed by the third single "Human", a track with a mambo-style beat. The fourth song, "Pilots", which describes travelers floating in the atmosphere above the earth, was inspired by John Barry's James Bond theme songs. In the United Kingdom, a remixed version of the song was released as a single and charted within the top seventy-five. The ballad "Deer Stop" features childlike vocals and sexually suggestive lyrics. 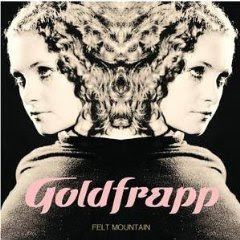 The title track was influenced by Goldfrapp's "idea of a wolf being whipped in this little Tudor house overlooking a snowy landscape". "Oompa Radar", the seventh track, was inspired by Roman Polanski's film Cul-de-Sac. The cabaret influenced song uses a flugelhorn and a cuckoo clock to switch between tempos. "Utopia" was released as the album's second single. The album closes with "Horse Tears", a minimalist piano ballad with filtered vocals.